The ground around the site is so sensitive and so sacred that Peru has even forbidden presidents and top officials to walk where the Greenpeace activists went. Peru's Deputy Culture Minister told the BBC: "They are absolutely fragile. They are black rocks on a white background. You walk there, and the footprint is going to last hundreds or thousands of years. And the line that they have destroyed is the most visible and most recognized of all." Tourists generally get to see the site from the air, or, on rare occasions, are equipped with special footgear. Several Greenpeace activists entered into the prohibited area beside the figure of a hummingbird where they laid big yellow cloth letters reading: "Time for Change! The Future is Renewable." They were also sure to leave a signature. The message was intended for delegates from 190 countries at the UN climate talks being held in Lima. 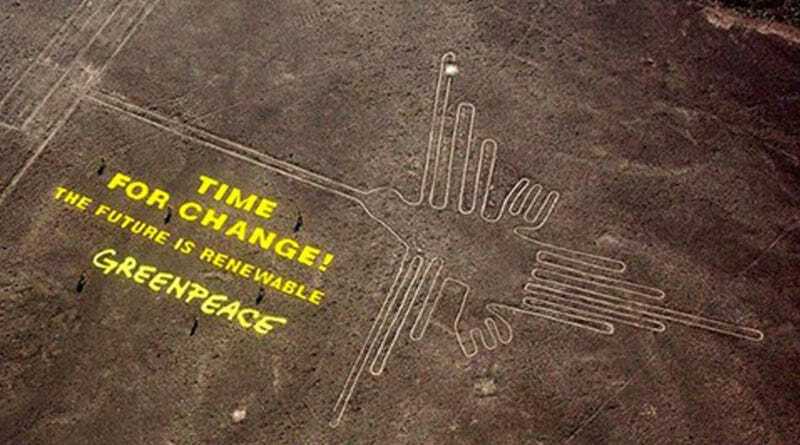 Yesterday, Greenpeace apologized for the stunt, saying it was sorry if the protest at the historical site on Monday caused an "moral offense" to the Peruvian people. The environmental activist group said it would collaborate with the government to determine if any damage was done to the site, and that it would stop using photos of the protest in its campaigns. Greenpeace is also sending its Executive Director Kumi Naidoo to Lima to apologize in person to the Peruvian government.